Essential plot rundown: Evil villain slowly changes to become super hero. I did not really like this movie. IT HAD THE SAME ENDING AS DESPICABLE ME! AGH! Well, in this one, at least it fit a little and didn't come out of left field. But, I didn't think it was that funny or engaging. There weren't a lot of specific things that bothered but one was Bernard. His character just feels out of place. He's introduced and boom, he's replaced by Megamind. We don't even know who he is. His character should have been introduced a little earlier. That way it will give us a reason as to why Roxanne suddenly becomes attached to him. 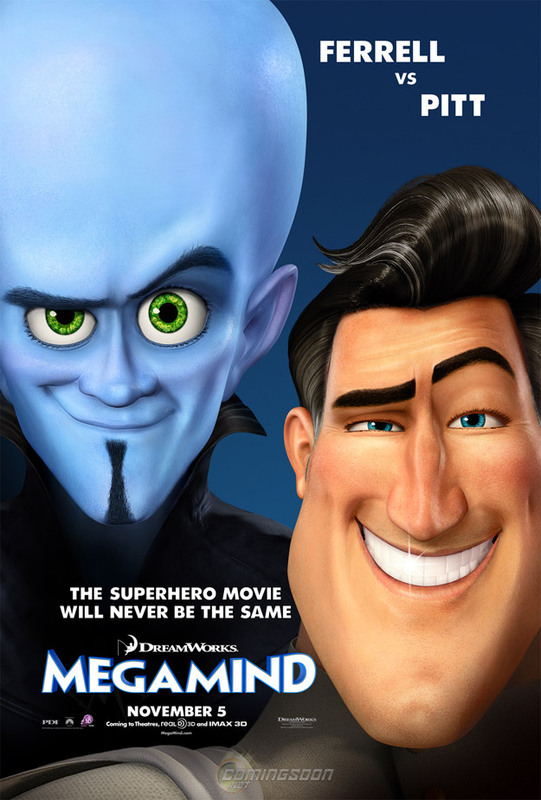 Why did she call him when she found Megamind's secret lair? Why not Hal or her boss or the police or something? I wanted some background between the two. And that was really the only thing I didn't like about it. Other than its lack of being funny. There were a couple of times that I laughed, but most of the time the jokes felt forced. However, I liked the ideas; they just weren't executed properly. I found the question "What does a Villain due if he defeats the hero?" to be an interesting one. I also liked the idea of the hero faking his death to escape from it all. I would have liked to see more of that. (If there's a movie that deals with that, please, let me know). The movie had potential; it just didn't go anywhere with it. So, to make a long story short (though this is a shorter review), I didn't really like it. Well, I said that at the beginning, so you already knew that. While it's not a bad made movie (*ahem Breaking Dawn), it just wasn't my thang.